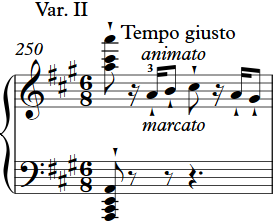 The editor skips the "ritornello" and the "Var. II" and continues in the same breath, 39 bars later on. 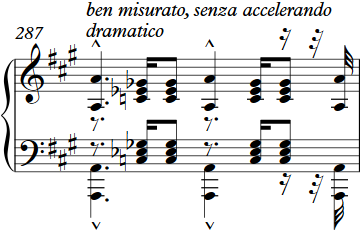 Before the penultimate bar of the song, Liszt begins a symphonic development, that also forms a dramatic climax. The editor plays the whole development in the character of "tempestuoso. "; Thus in the same sense as our note at bar 31 tries to interpret this phrase. "Toujours marque et mesure" (always strongly emphasized and measured), a provision which states that the sharp rhythmic and thematic outline should appear lifted from the fog of figural and modulating background. "storming and yet restrained" (the latter also for economic reasons), "more threatening than erupting" should be a more exhaustive description. 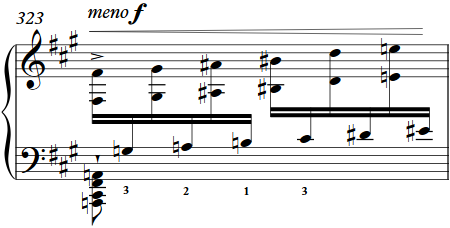 This has become a familiar technique that when it appeared (I think it appeared first of all in Liszt's operatic fantasies) awakened a distressed amazement. It is said that even during a peformance of the of "Don Juan-Fantasi" by Carl Tausig the audience had raised at this point from its seats. An insistence contradicts the prescribed "mesure". Also, it would be hardly feasible. It would be worse to delay the pace due to physical strainedness. The definition of the editor has proved that risk antagonistic. (See also the note at bar 53). 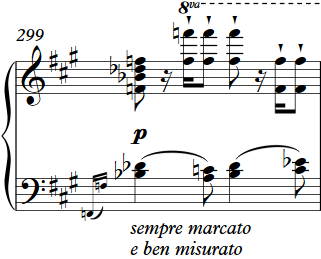 Liszt inserted here an abridged version of the passage leading to the final aria (bars 338-378, "either-or"), Ferruccio Busoni prefers the Ossia (bar 634) because the shorter version literally anticipates everything Liszt, which is included in the aria.